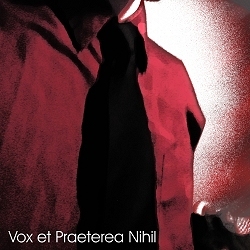 Vox et Praeterea Nihil is a concept album that takes its cue from the Latin phrase meaning “A Voice and Nothing More.” Adhering to that concept, each track is derived from a single vocal sample. The nature of the vocal sample used varies from track to track, but each is comprised of nothing more than a voice. Vox et Praeterea Nihil delivers this concept in the form of 7 ambient pieces ranging from deep and luscious dark drone to noisey dark ambient. Available at iTunes, AmazonMP3 and other online retailers.